"Indefensible,” a new book from Justice Strategies and Grassroots Leadership, examines the costs and failures of over a decade of criminalization of border migration. 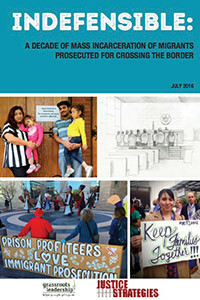 Operation Streamline was launched in 2005 and added criminal convictions to the previous civil removal process, and is known for the disturbing spectacle of mass courtroom proceedings in which up to 80 shackled migrants are arraigned, convicted and sentenced for misdemeanor improper entry charges. While the Streamline courts have been scaled back in several districts, the legacy continues in federal courts, and includes related massive immigration prosecutions for both improper entry and felony re-entry. In 2015, half (49 percent) of all federal prosecutions were made up of what is essentially a crime of trespassing, in the form of improper entry and re-entry prosecutions. The costs associated for just the incarceration of migrants is conservatively estimated around $7 billion since 2005, not including the enormous drain on court resources or human lives. Despite the enormous costs and the wasted lives, research has not found incarceration to be an effective deterrent to migration, which is more strongly influenced by family ties and economic circumstances. As the nation struggles with the legacy of mass incarceration, decarceration efforts must include work to end the criminalization and mass prosecution of migration. Mass courtroom proceedings in which up to 80 shackled migrants have been arraigned, convicted and sentenced for improper entry, all within a two to three hour timespan, raising many serious legal issues. A national federal court docket 49 percent of which was occupied in 2015 with the prosecution of 70,000 migrants for improper entry and re-entry, and impacting the prosecution of more serious federal crimes. A federal prison population 23 percent of which is now composed of non-citizens, although these non-citizens represent only seven percent of the U.S. population. Current average sentences of 17 months for felony re-entry, according to the U.S. Sentencing Commission, in addtion to what in any case will ultimately be civil deportation proceedings for those convicted. Federal contracts for 13 new "Criminal Alien Requirement" prisons provided to politically powerful private prison corporations from 2000-2013. Bethany Carson, co-author of Justice Strategies and Grassroots Leadership's book Indefensible, is interviewed by David Martin Davies of Texas Public Radio's Texas Matters. The audio interview covering key findings of the book begins on minute 13 of the imbedded link above (also found by following link in: "Read the original article" hyperlink).